Military Service is undoubtedly one of the highest callings any citizen can answer for her country. Answering that call may require, among other sacrifices, stepping in to harm's way and/or spending large swaths of time apart from one's family. Regardless of how one lives out a military career, navigating countless financial options is a requirement. The latest flavor to negotiate is the novel Blended Retirement System - "BRS" for short. This scheme replaces the Legacy Retirement System - a "Cliff Vesting" program where military members earn 2.5% per year of credits with a 20-year minimum of service required for an eventual annuity payout for the remainder of the service member's life. The final percentage is determined by years of service multiplied by 2.5%. This product is then multiplied by an average of the High-3 of monthly base pay, which is then paid out monthly for life with inflation adjustments. For a variety of reasons not discussed here, the federal government decided to modify these terms for new recruits. Instead of 2.5%, the crediting rate is 2.0% with the 20-year minimum service requirement still in force. The trade-offs for this reduction are a baseline contribution of 1% of Base Pay to the Government's Thrift Savings Plan (The TSP - which is loosely equivalent to a civilian 401(k)) coupled with matching funds up to 5% of base pay. This funding mechanism guarantees that from this point forward EVERY individual who ever serves in the armed forces will walk away with at least some retirement funds. The Armed Forces threw another wrinkle in the retirement scheme conversion process by allowing existing service members to opt-in to the new BRS, thus forgoing the Legacy Retirement System. This opportunity has created a significant and somewhat complicated financial choice for the younger members of our military. For new arrivals, your situation is simple...you are inheriting the BRS. While not perfect, it is a high-quality plan providing meaningful retirement benefits to all members or our military. For those with greater than 12 years of service, your retirement system remains the same with no option to change horses. Like the BRS, the Legacy System is not without its flaws; on the whole, however, it is a remarkably good deal. The rest of this article is for existing members with less than 12 years of service who entered service prior to January 1, 2018. I could list other exceptions (i.e. Service Academy Cadets & Midshipmen) and accommodations (i.e. Certain Reserve Component situations) to the rule, though it would drive this article much longer than it already is. As a veteran of numerous government electronic training initiatives, I am well-aware of the varying quality of the products. That said, I can provide an unqualified endorsement to the Government's collective efforts to produce top quality content to educate all service members on the new BRS for new recruits as well as those eligible to convert. Simply put, you cannot make an informed decision unless you are aware of all the nuances of the BRS. And the On-Line Training provided certainly does that. Moreover, every military installation and Command will have qualified individuals to further explain complex situations or answer other questions unique to you. COMPLETE THE TRAINING, THAT'S AN ORDER! Again, hats off to the government for providing an absolute top-notch product for all service members. If you have not used it, the financial calculator at the following link: BRS Calculator is invaluable. You can project nearly every conceivable potentiality related to BRS versus the Legacy Retirement System. At the end of the day, opting into the BRS is mostly a numbers game, so you have to be able to generate the numbers necessary to make an informed decision to opt in or opt out. 3) Know if you are definitely NOT going to stay in the military for 20 years. Every service member joins for different reasons and with different exit strategies in mind. If you are one who joined knowing there is ABSOLUTELY no way you are going to stay for 20 years, then the Legacy Retirement System is 100% not for you - the reason being there is no government enhanced retirement benefit within that system if you do not reach 20 years of service. You can, of course, make elective TSP contributions, though that option os available to you no matter what retirement system in which you participate. With the BRS, you at least get a minimum (1%) of government-provided funds, which is a lot more than $0. That is a very basic check-list for all to use. Now we move on to the most complex situation: those military members who are considering opting out of the Legacy System in favor of the BRS AND also plan to remain in the military until qualifying for a military retirement (20 years of service). Again, it is impossible to provide a formula applying to so many uniques situations. Therefore, I will simply offer a few thoughts to consider while contemplating opting in to the BRS. 1) For most people intending to stay 20 years, the Legacy Retirement System is likely a better deal than the Blended Retirement System. At the end of a 20-year career, the difference between 40% and 50% of base pay can be substantial - perhaps as much $1,000 per month (or more). In order for the BRS to make sense in these cases, the matching funds and subsequent investment returns will have to exceed what you are giving up in your retirement annuity. A complicating factor is that most military members retire between 40 and 50 years old with Retired Pay starting immediately. TSP Funds, conversely, are not reachable without penalty (in most cases) until age 59 1/2. So if you are contemplating the BRS in lieu of the Legacy System strictly because of potential matching funds you will receive and their subsequent price appreciation, please give considerable thought to what rate of return you are assuming for your projections and the increased deferrals required to make the benefits of the BRS exceed the Legacy System. While anything is possible in financial markets, typically using any 2 digit whole number (i.e. something greater than or equal to 10% per year) for investment projections is not recommended, and perhaps fantastical. 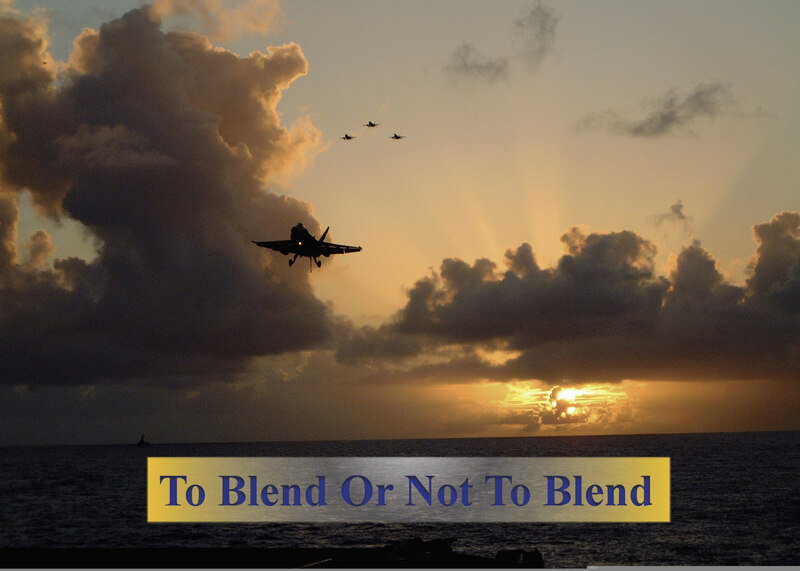 2) If you anticipate a highly-compensated job upon exiting the military, the Blended Retirement System may make sense for you. Up front, I emphasize the word may here. Let's take, for example, our military's medical doctors (you could also substitute airline pilots if you like). Depending on the nature of the service commitment, some doctors may be able to exit the military at a relatively young age. Assuming he/she has the appropriate qualifications and certifications, he/she may be able to walk straight in to private practice. Depending on the specialty, the salary upon exit from the military may be exceptionally high, thus driving taxable civilian income into the highest income tax bracket, which reduces the value of the military pension somewhat. Thus, the reduced pension value may be offset by the increased deferrals made while still in military service. Moreover, the compounding during the subsequent career will inure in the doctor's benefit on a tax-deferred basis. And finally, once the doctor completely retires, income will presumably drop to a lower level with a lower pension, thus making the Required Minimum Distributions (RMDs) from the deferrals more palatable tax-wise. I made a plethora of assumptions in the above paragraph. However, I wanted to provide at least one instance where the BRS could make sense - I understand this was a rather extreme case. So please do not opt-in to the BRS without carefully considering the unique assumptions you will have to make when calculating if such a choice is right for you. 3) If you anticipate a very high VA Disability Rating, the Blended Retirement System may make sense for you. Every military retiree is eligible to make a disability claim to the Veterans Administration (VA). Veteran Service Organizations (VSOs) throughout the country provide invaluable assistance with this process, to my knowledge, at no charge. If you are nearing retirement, I strongly recommend seeking out a VSO near you for assistance with your Disability Claim...the benefits to doing so are simply enormous. Without describing the rating process, the result is a rating in terms of a percentage corresponding to a monthly, inflation adjusted annuity that is completely tax-free. For ratings below 50%, military retired pay is off-set by disability pay. For ratings 50% or higher, a separate tax-free payment is made. Disability payments can be quite substantial. For example, a 100% rating, depending on a few other factors, can approach $3,000 per month tax-free...serious money, so serious that is could impact one's decision to opt-in to the BRS. Obviously, it is VERY difficult to assume any disability rating, let alone one that is over 8 years away (recall who is eligible to opt-in to the BRS), so opting-in based solely on VA Disability requires serious contemplation. 4) If there is any doubt, seek help. If you are in any doubt about what to do, it is time to consult a financial professional who can provide unbiased advice about your unique situation. Military members are charged with defending our country, not being financial experts. Opting in to the BRS is an exceptionally big decision - and one you cannot take back. So if you are considering it, I would strongly recommend running your calculations by a professional who makes these kinds of calculations every day for a living.